University dropout Michael Smith built a multimillion-dollar business fitting out movie theatres around the world, before restoring Melbourne’s Sun Theatre and becoming one of the country’s last independent cinema operators. After a business deal went bad, and shaken by how close he had come to being wiped out, Smith took an even bigger risk: to become the first person to fly solo around the world in an amphibious plane, retracing the 1938 Qantas, Imperial and Pan Am flying boat routes between Sydney, Southampton and New York. 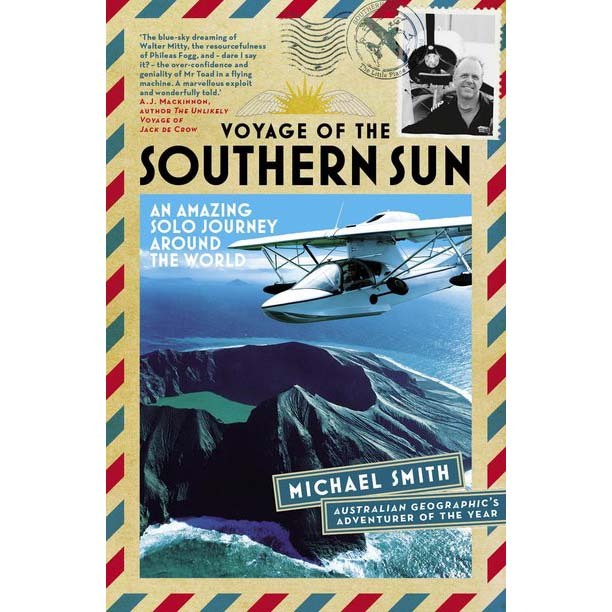 With limited flying experience, no support team and only basic instruments in his tiny single-engine flying boat, the Southern Sun, Smith risked his life to make modern aviation history. His adventures include an unexpected greeting by Special Branch on his arrival in the UK, a near-death experience while leaving Greenland, and a journey up the Mississippi, landing on the river and sleeping on sandbanks at night. He made eighty stops on his flight around the globe, exploring cities and communities, as well as visiting some seventy cinemas. All along the way Smith was updating his online journal, cheered on by more than 50,000 followers. Smith’s historic flight lasted seven months, and took him from Australia to East Timor, Indonesia, Singapore, Malaysia, Thailand, Bangladesh, India, Pakistan, Dubai, Abu Dhabi, Saudi Arabia, Israel, Crete, Croatia, Italy, France, England, Ireland, Scotland, Iceland, Greenland, Canada, the United States, Japan and the Philippines, before finally returning to Australia. This is the incredible story of his journey.